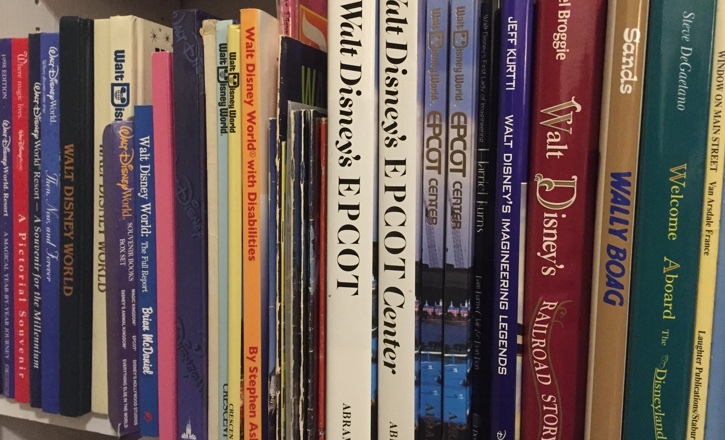 Have a Disney- or theme park-related book? Want to have it reviewed in front of 50,000 to 100,000 Disney fans and enthusiasts? I’m happy to accept review copies of physical books. I also review software, films and other media as long as there is a Disney or theme park connection. Just a few of the close to 1000 books (Disney, theme parks, etc) in my personal library! I’ve been reviewing books, DVDs, blu-rays, video games and other media since the launch of ImagiNERDing in 2007. In 2012, I started writing and editing the weekly Disney Review column at Mice Chat. In 2015 all written reviews appeared exclusively here at ImagiNERDing. They also appear on Communicore Weekly in the George’s Book of the Week and 60-Second Review segments. To check out examples of my reviews, click here or on the BOOK REVIEWS tab at the top of the page. People all over the world have come to rely on the various reviews I have published at Mice Chat, Communicore Weekly and ImagiNERDing. I retain a high level of integrity and will never trade a positive review for a free copy of a book or blu-ray. Contact me through e-mail at [email protected] to find out how to get review copies to me! Or, you can hit me up on various social media platforms through the links on this site.